Widely recognized post-war artist Jean Dubuffet (French, 1901-1985) maintained a rebellious attitude toward prevailing notions of high culture, beauty, and good taste, and was a relentless innovator from the time he committed himself to art making in the early 1940s. Jean Dubuffet: Soul of the Underground, the first monographic presentation on the artist at MoMA in over 25 years, illuminates Dubuffet's radical experimentation with form and material by focusing on the key moment in his career, from the 1940s to the mid-1960s. He mixed sand, gravel, and other materials into his pigments, applying them in layers with brushes and palette knives to create a thickened impasto, and then excavated images from them by scratching and scraping away with the pointed handle of his paintbrush. He revolutionized lithography, experimenting with textures by attacking lithographic stones with sandpaper, rags, and chemicals, and creating images with dirt, fruit peels, leaves, and other organic materials. Drawings in ink or gouache mimicked these feats of combination and re-combination, resulting in surfaces of decaying or ever-expanding membranes. This exhibition draws on MoMA's unparalleled collection of paintings, sculptures, drawings, prints, and illustrated books by Dubuffet and shows his move towards near-total abstraction with pictures comprised of allover compositions unanchored by horizons, topographies of layered sand and dirt, or patterned lithographs of droplets and granules. 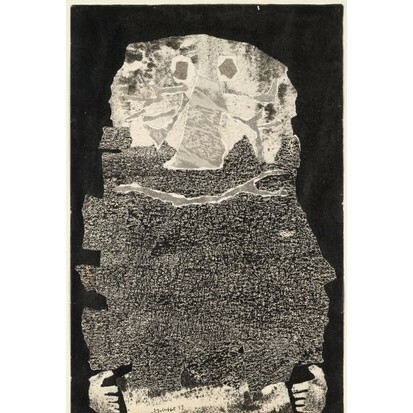 Central to this presentation is a monumental lithographic project, the Phenomena series (1958-62), which manifests the artist's fascination with surfaces of the Earth and natural forces, and which became fodder for future works across mediums, as he cut up prints, collaged them, and reconstituted them.